(Buy any 3 or more La Roche-Posay products and save 5%) Sorry, this item is currently unavailable. Click here to receive notification when this product comes back into stock. A well priced protective spray-mist especially made for children's skin - High UVA and UVB protection. 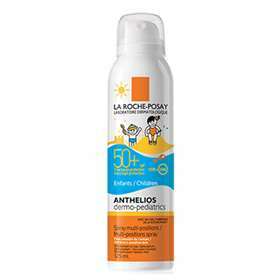 La Roche-Posay Anthelios Dermo-Pediatrics Aerosol Spray SPF 50 for children is an easy-to-apply sun protection lotion for those who are sensitive to the sun. The formula is quickly absorbed into the skin and is water resistant. Anthelios Dermo-Pediatrics Aerosol Spray contains child-friendly ingredients to reduce inflammation and to protect them from harmful UVA and UVB rays. Apply 30 minutes before sun exposure. Repeat every 2 hours and after swimming. External Use. Children under 3 years old should not be exposed. Children's fragile skin is protected from sunburns and UV-related cell damage. AQUA / WATER, C12-15 ALKYL, BENZOATE, GLYCERIN, PROPYLENE GLYCOL, ETHYLHEXYL SALICYLATE, ALCOHOL DENAT., BUTYL METHOXYDIBENZOYLMETHANE, OCTOCRYLENE, BIS, ETHYLHEXYLOXYPHENOL METHOXYPHENYL TRIAZINE, TITANIUM DIOXIDE, ETHYLHEXYL TRIAZONE, POLYESTER-5, DROMETRIZOLE TRISILOXANE, ACRYLATES COPOLYMER, CAPRYLYL GLYCOL, ETHYLENEDIAMINE/STEARYL DIMER DILINOLEATE COPOLYMER, PENTASODIUM ETHYLENEDIAMINE TETRAMETHYLENE PHOSPHONATE, TEREPHTHALYLIDENE DICAMPHOR SULFONIC ACID, TOCOPHEROL, TRIETHANOLAMINE.